A whole-house generator will keep electrical appliances running in your home even if your utility provider experiences a power outage. 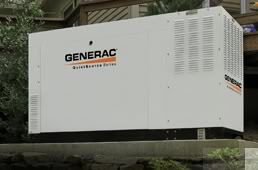 Emergency, standby or backup generators can be installed outside your home to provide power for everything from refrigerators, freezers and lights to life-saving medical equipment. Generators take over as soon as grid power is interrupted, and turn off once grid power is restored. To help you make the right choice, this guide provides information on the types of whole-house generators available. An automatic transfer switch (ATS) will automatically turn your generator on in the event of an outage. The big advantage of having an ATS installed on your whole-house generator is that you do not have to be home to start it. If you travel often and live in an area that experiences frequent power failures, a generator with an ATS is recommended. Transfer switches are available in three sizes: 50 amps, 100 amps and 200 amps. Ask your electrician to help you choose the right size or check for the information on your home’s main breaker panel. A manual switch requires the homeowner to be present in order to turn on the whole-house generator and provide power to the home’s appliances. Though less expensive, manual operation switches are less desirable. Part of your decision will be based on whether you want to power all operations in your entire home or provide energy for scaled-back operations to a few necessary appliances, such as a typical 4-ton central air conditioner, plus a few other kitchen appliances and electronic equipment. The general rule of whole-house generators is that the most powerful are also the most complicated. Air-cooled generators provide only up to about 20 kilowatts of electricity but are sufficient to power most single-family dwellings. For larger homes, bigger, more expensive liquid-cooled units are required. Common liquid-cooled units generate up to about 150 kilowatts of energy. By carefully considering the appliances and equipment you intend to use if a power outage occurs, you will better equipped to purchase the appropriate whole-house generator. For more information and professional installation, contact a licensed electrician in your area.